Greenville, SC - The Greenville Drive have been selected by the South Carolina School Boards Association as a recipient of the Champions of Public Education Award in recognition of their commitment to public education in the Upstate. The South Carolina School Boards Association has been issuing the Champions of Public Education Award since 2009, and each quarter, individuals, organizations and local businesses are recognized for their contributions to public education. These contributions include support of local education programs, actively working for the betterment of public schools, and doing their part to inspire support for public schools. Previous recipients of the award in support of Greenville County Schools include The Cliffs Communities, Hubbell Lighting, and Public Education Partners. The Drive's consistent efforts in outreach towards public schools is manifested in many ways. The Michelin Reading All-Stars Program works with public schools and library systems to promote reading enjoyment and academic success, and the program has reached almost 700,000 children over 11 years. The Drive also hosted the inaugural Teach864 Night at Fluor Field this season, which recognized teachers in Greenville County Schools for their dedication and service to their students, their schools, and the local community. In addition, the Drive have hosted Health Careers Night and Advanced Manufacturing and Engineering Night the past few seasons, both of which are designed to educate, inform, and spark interest in those fields for students of all ages. "Being committed to education is a major component of our community platform, and it is a tremendous honor to be recognized for that commitment with the Champions of Public Education award," said Drive Owner and Team President Craig Brown. "Our schools in the Upstate are doing a commendable job preparing students to be the leaders of tomorrow, and we consider it a privilege to help out in the development of these young students through our education programs and specialty career nights." "The Greenville Drive franchise has been an exemplary community partner for Greenville County Schools for many years," said Dr. Burke Royster, Superintendent of Greenville County Schools. "Craig Brown always responds affirmatively when we call on him. The Drive has assisted us in honoring all GCS employees through our employee appreciation night, raised the profile of teachers through the Teach864 Campaign, helped educate our families about careers in health and manufacturing, supported academic success in GCS student-athletes, and participated in our AdvancED accreditation review. "Together, we have co-presented to groups such as TransformSC on the value of public-private partnerships. In short, the Drive has thrown its name recognition and brand value behind our public schools and we are incredibly grateful for their commitment to our cause." 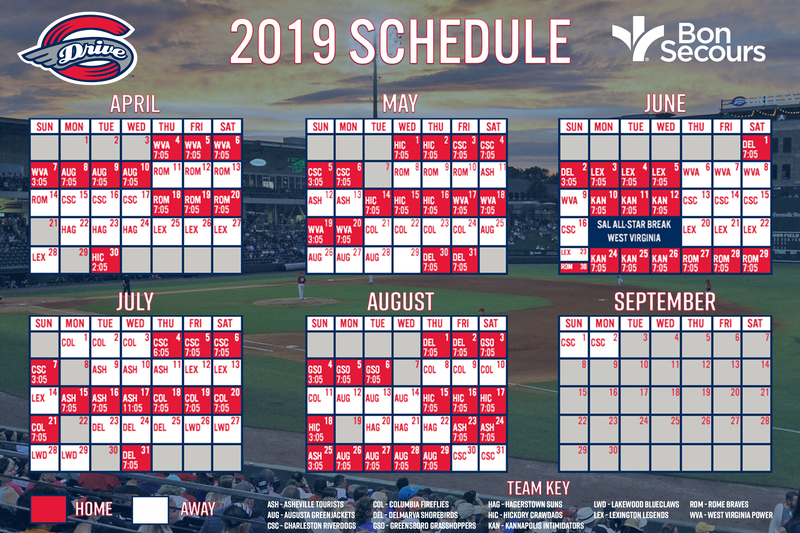 The Greenville Drive, the South Atlantic League affiliate of the Boston Red Sox, just completed its 13th season at award-winning Fluor Field in downtown Greenville. Since 2006, more than 400,000 fans a year have been welcomed to Fluor Field for both Drive games and additional community events. In 2017, the Drive was honored with the prestigious John H. Johnson President's Award, presented by Minor League Baseball and given to "the total baseball franchise," based on contributions to baseball in the community, promotion of the baseball industry, financial stability and contributions to league stability. 80 Drive alumni have gone on to play at the major-league level, 13 of which were members of the Red Sox 2013 World Series Championship Team.